An announcement that it would be procuring the MV-22 Osprey adds another element to a future amphibious marine force. A recent announcement by Japan’s Ministry of Defense that it would be going ahead with the procurement of the MV-22 Osprey was another step its methodical efforts to piece together the necessary tools to launch an amphibious marine force modeled after the United States Marine Corps. The announcement outlined plans to procure 17 of the tilt-rotor aircraft over a three-year period beginning in fiscal 2015 through fiscal 2018. Produced by U.S. aerospace manufacture Bell Boeing, the Osprey is functions as a dual-use, tilt-rotor aircraft that can both hover as aircraft and fly like a conventional airplane. Although the MV-22 Osprey is unpopular in Japan due to its suspect safety record, the Japan’s procurement of the aircraft didn’t come as much of a surprise. Japan has been eyeing the aircraft for quite some time. 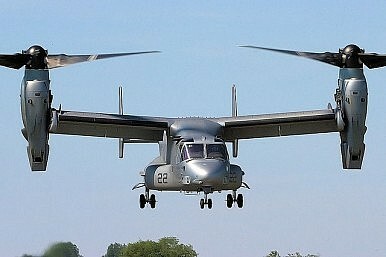 Although the Osprey’s safety record was marred by several high-profile accidents during the early testing phase, the United States Marine Corps have deployed it in full operation capacity since 2007 without incident. It is also rumored that the Japan intends to deploy the F-35 Joint Strike Fighter on the new “helicopter destroyers” to bolster Japan’s maritime strike capabilities. To date, however, Japan has only purchased the F-35A variety, which does not have the V/STOL capabilities the F-35B possesses. For now, the F-35 scuttlebutt remains just that, gossip. Given the massive cost overruns the F-35 program has been experiencing, many countries that have already purchased the fifth-generation fighter are reluctant to acquire more. Japan fall into that category, making any future purchases of the F-35B unlikely at this point. The F-35 fighter has also come under fire for failing to live up to expectations. In June 2014, the Pentagon grounded the entire U.S. fleet. A brief examination of current geopolitics in the Asia-Pacific makes the purposes of creating a SDF marine force and the procurement of the MV-22 Osprey perfectly clear. As Defense Minister Itsunori Onodera pointed out, Japan “has numerous remote islands, and islands of various sizes…That makes it important to provide defense for the islands in the coming years.” While, Onodera didn’t specifically cite the ongoing Senkaku/Diaoyu Island dispute, it could be reasonably assumed that defending and/or retaking the islands in the event Chinese aggression is the foremost concern among Japanese military planners. The Osprey will likely be deployed in significant numbers around southern portions of Japan, including Kyushu and Okinawa. Speaking at the OPCW, Japan's defense minister emphasized North Korea's other weapons of mass destruction.